Reusable sections are used to save commonly used content, allowing you to create your proposals in a fraction of the time. Reusable sections are at the core of Nusii’s power. If you intend to use a section of content more than once, it’s a good idea to create a Reusable Section. You can create either reusable Text sections or reusable Pricing sections. Reusable Sections can be inserted at any point, into any proposal. 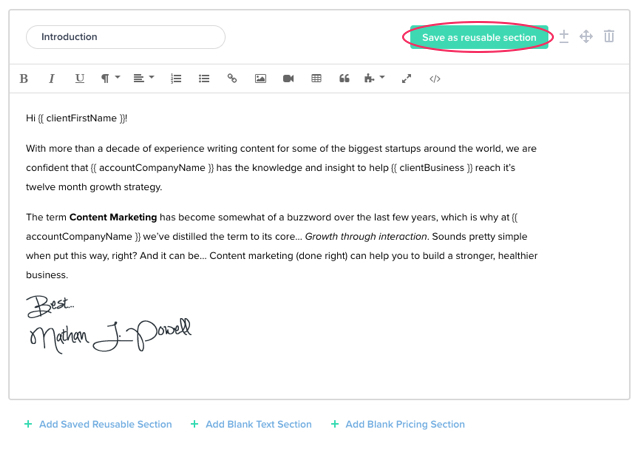 Creating a Reusable Section is as easy as writing your content and clicking on the “Save as Reusable Section” button. This will open a popup that asks you to name your section. By default the reusable section takes the name used in your proposal. However, it’s a good idea to give the Internal Use Only input a name that will mean something to you in the weeks and months to come. The second input area is the section name that will be displayed to your client. Once you click Save, your Reusable Section will be ready to insert into any proposal. You can view and edit your Reusable Sections by clicking on “Sections” in the left-hand menu. From here you can edit and delete your Reusable Sections. Inserting a saved Reusable Section is as easy as clicking on + Add Saved Reusable Section at the end of any section whilst in Edit mode. From here you can select the content you need and drop it into place!